How far back in time does the feed go? Does it just pick up from the moment you create an Event? Flyboost starts collecting boosts from the moment you create the Event. We do not collect historical boosts containing that hashtag from the past. If you have an event you want to collect boosts for in advance (a wedding / promotional event would be a great examples) you might want to start tracking that hashtag a week before the party – or however long makes the most sense to impress your client’s and engage party guests. An event refers to the client, venue, date, or type of gig you’re working. Groups can contain one Event, or as many as you like. What does the Modify button do? The Modify button can be used on either the Groups or Events view. When clicking the Modify button you have the ability to change the Group name (while on the Group view) or within the Events view you can change the Group name which that particular event is associated with, move the event to another Group, or both. Be sure to click the Update button below to initiate the change. How does the Quarantine All Boosts function work? Within the user interface in the Content Filtering section we provide a checkbox where if checked the functionality exists to send all boosts to the Quarantined Boosts tab view. Why would you consider enabling this feature? You can have complete control of all boosts which make it to the “big screen”. Obviously, this can be helpful for filtering objectionable content but it can also be helpful to enforce a “velvet rope” where only the most fun and entertaining boosts are made visible. This can be handy if there’s a large audience and boosts are being collected at a rate which could be difficult to manage. Why would you consider disabling this feature? It may require monitoring throughout your set or event. It might not be time consuming to manage and some users might want to create an “anything goes” environment where people can freely boost content to get the party moving. In a effort to consider all types of parties, venues, management styles, and crowds we’ve created this feature so it can be used at your discretion. A “boost” refers to user generated messages which are collected by Flyboost before, after, or during an event. Currently, boosts refer to Tweets or posts on Instagram. Why should I give the live social display a try? 1. Create an interactive element. In bar, club, restaurant, or event settings, keeping people engaged will keep them there for a longer period of time. This should, in turn, lead them to spend more money. 2. Encourage people to post on social media, simply because they want to see themselves on TV. You will now have a database of people you can now market to and build your social following. Interested? Here are 10 more reasons why your crowd and venue will absolutely love Flyboost. 3. When someone posts using the hashtag you set, it can be seen by all of their friends and followers. Increase attendance (or awareness) of the venue or any party, promotion, or event. 4. Command higher pay for your party, promotion, or event. Entertainment Pros: Land new gigs by having Flyboost in your arsenal. It’s always a hit at weddings, dances, proms, and Sweet 16’s. 5. It’s super fun! Social media isn’t going anywhere and it’s only becoming more widely used. Tweeting and sending Instgram posts to the big screen like “magic”, is just plain fun for everyone! We offer a FREE 7-day trial of Flyboost, so what are you waiting for? Give it a try today and separate yourself from everyone else by giving your crowd something that no one else can…FLYBOOST! How are hashtag tracked limits defined? Hashtag tracked limits refer to the amount of active hashtags collecting boosts. Only hashtags which are actively collecting boosts will be counted toward that limit. How often do you check for new boosts? We check for boosts every few seconds. Many times we’re able to pull and insert new boosts into your live feed immediately after a user posts new content on Twitter or Instagram. Does Flyboost have an affiliate program? No. Flyboost does not currently have an affiliate program. What’s the best way to monitor the feed in the Flyboost user interface during live events? We recommend that you DO NOT monitor the feed from the computer used to display the live feed. While you are certainly welcome to doing that if it’s the only option, we feel most users would rather not put any extra strain on their computer than necessary to avoid any potential hiccups or crashes. Also, to prevent any user error that might happen while managing the feed it’s best to manage and monitor from another device. Instead, we built our website and user interface to be mobile-friendly so that you can actually monitor your feed from your phone, tablet, or any device which has a web-browser! 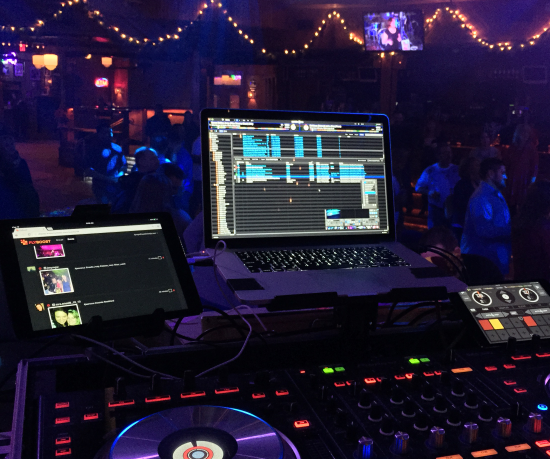 Another great idea came from DJ Jason Cruz who helped us to beta-test Flyboost at Seacrets in Ocean City, MD – he actually monitors his live event feed using an iPad mounted on a stand, and we think his setup looks incredible! While Jason’s setup is that of a seasoned event professional, monitoring and managing live feeds can be done from anywhere using any device you’re comfortable with that’s connected to the Internet. Is it possible to customize the Quartz files provided in the Downloads & Extras Section? Since it can be easy to inadvertently cause functionality issues, we do not recommend attempting to customize our Quartz files. However, we realize that there will inevitably be a few Quartz Composer “gurus” who will be inclined to create their own modifications to the appearance of our file. In that case, we welcome your creativity! However, if you break the functionality during any of your editing escapades, simply re-download the original file from our website and try again! Can I run contests using Flyboost? Yes. Let your imagination run wild when promoting social-driven contests powered by Flyboost. We’ve had success running selfie contests as well as ugly sweater contests at parties and events. As we experiment running different types of contests using Flyboost, we’ll be sure to let you know. As always, check out our blog for new and exciting updates from Flyboost which often showcase strategies and successful applications of the software. Does Flyboost currently support Serato Video software? No. Flyboost does not currently support Serato Video software. Flyboost is currently compatible with MixEmergency by Inklen and Resolume Avenue. We recommend MixEmergency for most applications and Resolume for larger venues. Can I track an unlimited amount of hashtags with Flyboost? Yes. We offer an unlimited amount of hashtags tracked on our Multi-Platinum plan. To upgrade or downgrade your Flyboost account, please click the “Upgrade Plan” button within the Billing Information section in the user interface, located in the upper right corner. After clicking the “Upgrade Plan” button, you will be prompted with the packages that you can select to either upgrade or downgrade your plan. In order to downgrade, your account must satisfy the hashtags tracked and live event feeds requirements necessary to initiate the plan change. Upgrading or downgrading your account will take effect after payment is processed. Can I change or rename Groups or Events? Yes. To initiate that change, please click the “Modify” button which is visible within the user interface to the right of the date created column. What does the Live Feed indicator mean? With reference to the screenshot above, this applies to the green check mark indicating a live feed is enabled. A private URL has been generated so that you can display boosts at your venue which have been collected. I made a change to a Quartz file, loaded back into MixEmergency and don’t see changes. Why? This is a weird quirk with MixEmergency. If you notice that your changes are not in effect, simply try re-naming the actual Quartz file (i.e. change the filename from Flyboost-1.qtz to Flyboost-2.qtz). Then, re-load the renamed Quartz file back into MixEmergency and the changes should take effect. MixEmergency is crashing whenever I run Flyboost. Is Flyboost causing it to crash? We have noticed that whenever MixEmergency crashes while running Flyboost, it’s always related to the Internet connection/speed. We strongly recommend having reliable, high-speed Internet connection whenever running Flyboost. Slower connections can also cause photos/avatars to hang or load slowly onto the screen.